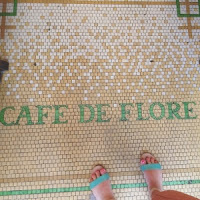 We started our third day with a visit to Cafe de Flore, Saint-Germain's second most famous cafe. Opened during the French Third Republic, it's name is taken from a sculpture of Flora (the goddess of flowers), located on the opposite side of the boulevard. Offering a wide menu including coffee, alcoholic drinks and food ranging from light snacks to full meals, the cafe (in my opinion) was overpriced due to its tourist hot spot reputation. I enjoyed a croissant and chocolate chaud whilst Russell ordered a coffee (it's worth noting that the french cafes don't serve latte or cappuccino - only frothed milk). 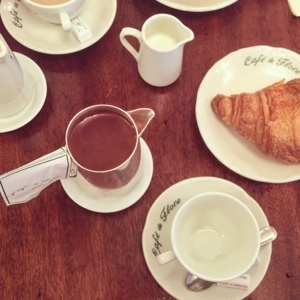 Whilst the cafe is worth a visit, the chocolate chaud wasn't as rich as Les Deux Magots. Like its main rival, it has hosted most of the French intellectuals during the post-war years. Authors Joris-Karl Huysmans and Remy de Gourmont were one of the first well-known regulars, soon joined by Georges Bataille, Robert Desnos, Léon-Paul Fargue, Raymond Queneau and Pablo Picasso.